Vertical style condenser made of Inconel 600 clad steel plates. The vertical-style condenser for a chemical contractor in Argentina. The main body material of the shell side is made of Inconel 600 clad steel plates: base metal – plates of ASME SA-515 Gr. 60 with 10 mm thickness; cladding metal – plates of ASME SB-168 UNS N06600 with 3 mm thickness. Medium: (gas) HCl, HF and Freon. 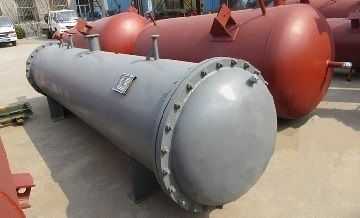 Design temperature and pressure: 285°C and 1.6 MPa. The clad plates are manufactured in accordance with ASME SA-265 [ASTM A 265] by explosive bonding.